"Hyperbolic curve" redirects here. For the geometric curve, see Hyperbola. 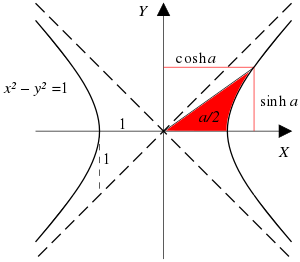 A ray through the unit hyperbola x2 − y2 = 1 in the point (cosh a, sinh a), where a is twice the area between the ray, the hyperbola, and the x-axis. For points on the hyperbola below the x-axis, the area is considered negative (see animated version with comparison with the trigonometric (circular) functions). Just as the points (cos t, sin t) form a circle with a unit radius, the points (cosh t, sinh t) form the right half of the equilateral hyperbola. The hyperbolic functions take a real argument called a hyperbolic angle. The size of a hyperbolic angle is twice the area of its hyperbolic sector. The hyperbolic functions may be defined in terms of the legs of a right triangle covering this sector. Hyperbolic functions occur in the solutions of many linear differential equations (for example, the equation defining a catenary), of some cubic equations, in calculations of angles and distances in hyperbolic geometry, and of Laplace's equation in Cartesian coordinates. Laplace's equations are important in many areas of physics, including electromagnetic theory, heat transfer, fluid dynamics, and special relativity. In complex analysis, the hyperbolic functions arise as the imaginary parts of sine and cosine. The hyperbolic sine and the hyperbolic cosine are entire functions. As a result, the other hyperbolic functions are meromorphic in the whole complex plane. By Lindemann–Weierstrass theorem, the hyperbolic functions have a transcendental value for every non-zero algebraic value of the argument. Hyperbolic functions were introduced in the 1760s independently by Vincenzo Riccati and Johann Heinrich Lambert. Riccati used Sc. and Cc. (sinus/cosinus circulare) to refer to circular functions and Sh. and Ch. (sinus/cosinus hyperbolico) to refer to hyperbolic functions. Lambert adopted the names but altered the abbreviations to what they are today. The abbreviations sh, ch, th, cth are also at disposition, their use depending more on personal preference of mathematics of influence than on the local language. such that s(0) = 0 and c(0) = 1. They are also the unique solution of the equation f ″(x) = f (x), such that f (0) = 1, f ′(0) = 0 for the hyperbolic cosine, and f (0) = 0, f ′(0) = 1 for the hyperbolic sine. where i is the imaginary unit with the property that i2 = −1. The complex forms in the definitions above derive from Euler's formula. It can be seen that cosh x and sech x are even functions; the others are odd functions. the last of which is similar to the Pythagorean trigonometric identity. For a full list, see list of integrals of hyperbolic functions. where C is the constant of integration. The function sinh x has a Taylor series expression with only odd exponents for x. Thus it is an odd function, that is, −sinh x = sinh(−x), and sinh 0 = 0. The function cosh x has a Taylor series expression with only even exponents for x. Thus it is an even function, that is, symmetric with respect to the y-axis. The sum of the sinh and cosh series is the infinite series expression of the exponential function. The hyperbolic functions represent an expansion of trigonometry beyond the circular functions. Both types depend on an argument, either circular angle or hyperbolic angle. Since the area of a circular sector with radius r and angle u is r2u/2, it will be equal to u when r = √2. In the diagram such a circle is tangent to the hyperbola xy = 1 at (1,1). The yellow sector depicts an area and angle magnitude. Similarly, the yellow and red sectors together depict an area and hyperbolic angle magnitude. The hyperbolic angle is an invariant measure with respect to the squeeze mapping, just as the circular angle is invariant under rotation. The graph of the function a cosh(x/a) is the catenary, the curve formed by a uniform flexible chain hanging freely between two fixed points under uniform gravity. Since the exponential function can be defined for any complex argument, we can extend the definitions of the hyperbolic functions also to complex arguments. The functions sinh z and cosh z are then holomorphic. Wikimedia Commons has media related to Hyperbolic functions. ^ Some examples of using arcsinh found in Google Books. ^ Niven, Ivan (1985). "Irrational Numbers". 11. Mathematical Association of America. doi:10.4169/j.ctt5hh8zn (inactive 2019-02-22). JSTOR 10.4169/j.ctt5hh8zn. ^ Robert E. Bradley, Lawrence A. D'Antonio, Charles Edward Sandifer. Euler at 300: an appreciation. Mathematical Association of America, 2007. Page 100. ^ N.P., Bali (2005). Golden Integral Calculus. Firewall Media. p. 472. ISBN 81-7008-169-6. ^ Weisstein, Eric W. "Hyperbolic Tangent". MathWorld. ^ "Derivation of tanh solution to 1/2f″ = f3 − f". Math StackExchange. Retrieved 18 March 2016. ^ Martin, George E. (1986). The foundations of geometry and the non-euclidean plane (1st corr. ed.). New York: Springer-Verlag. p. 416. ISBN 3-540-90694-0. ^ "math.stackexchange.com/q/1565753/88985". StackExchange (mathematics). Retrieved 24 January 2016. ^ Osborn, G. (July 1902). "Mnemonic for hyperbolic formulae". The Mathematical Gazette. 2 (34): 189. JSTOR 3602492.